If you want to pop up a quick temporary greenhouse to start your early plants, an inexpensive and very effective solution is the SpringHouse greenhouse. When you’re through with it you can fold it up and store it for next spring.It even includes, for free, this pretty – and useful – Butterfly Folding Stool. The greenhouse is 6 feet square, big enough to start seeds and small plants and protect them from the unpredictable weather changes of spring. It stands up to wind and does a surprisingly good job of keeping the day’s heat in throughout the night. You can put it just about anywhere. It has a zippered vent and door to keep insects out yet give you plenty of cross ventilation. It’s been reported that the door can be difficult to zip, but if you run a bar of soap along the zipper teeth, that should do the trick! The best price right now is from allgreenhouses.com . You’ll need a potting bench, which doesn’t come with the unit. 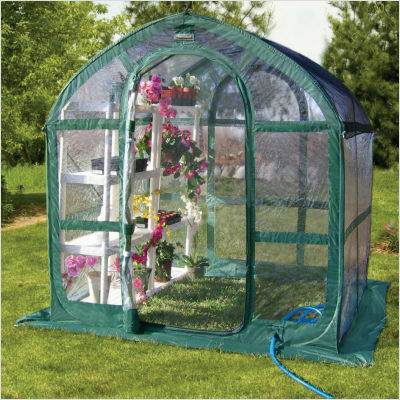 This folding one would be the perfect companion since the greenhouse also folds away when you’re not using it.